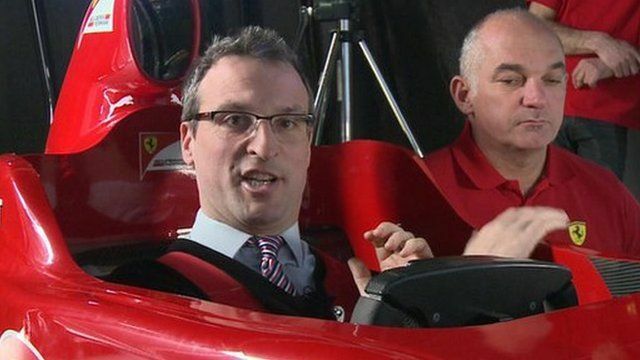 BBC transport correspondent Richard Westcott has been given access to a state-of-the-art Formula One car simulator developed by Ferrari and Shell. It is the same one that Fernando Alonso uses to practice for about two hours every day. It can be programmed to improve specific aspects of an F1 driver's skill, from reaction times to speed. It can also be programmed to try out different types of oil, fuel, tyres and even engines, simulating race conditions. These machines are regarded as vital for Formula One teams, which are now restricted to just 10 days of actual real track test time each season. Richard Westcott was helped during the simulation by Anton Stipinovich, who has designed cars for McLaren, Red Bull and Ferrari.